The Nissan Juke is definitely one oft the more stylized vehicles on the road today. Love it or hate it, it's different. There have been a number of cars in the last decade that immediately polarize people. Remember the Pontiac Aztek? Who could forget. But people that liked them were rabid about them. The Scion xB was another polarizer—it was love it or hate it. Heck, even Nissan’s own Cube falls into this category. You can add another to the list: The Nissan Juke. It’s been my experience that people either seem to think the car’s styling is forward and avant-garde, or they think it’s hideous and over-styled. I’ll admit: When Nissan first showed off its Juke, I wasn’t a fan. However, over my week with the Juke, it began to grow on me. However, the car never grew on fellow contributor (and my wife) Mercedes. She still thinks it looks like a design assignment that was never finished. Regardless, the exterior styling is undeniably different. Its low-mounted round headlights are flanked by the top-mounted, protruding turn signals. The Juke’s side profile is equally interesting. It’s somewhat bulbous; certainly shapely. Mercedes and I both agreed that the rear is arguably the Juke’s best asset. The sweeping taillights even have a hint of Volvo to them. The whole thing looks a bit amphibian-like to me. This Juke also had the optional spoiler adding a hint of sportiness. My Juke SL rolled on attractive 17-inch wheels. The car’s stance looks more like a crossover than a hatchback. 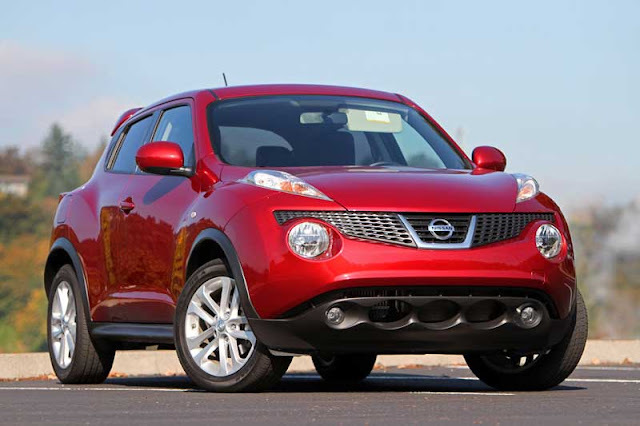 Then again, Nissan bills the Juke as a crossover, so there you have it. There is a distinct techy feel to the interior. It is also sporty and comfortable. Like the exterior, it is also polarizing. 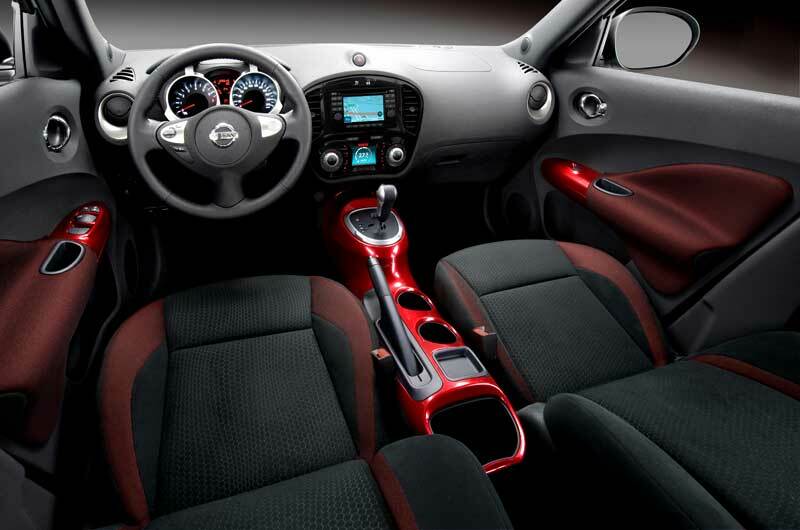 The Juke’s interior is equally different, although Mercedes and I agreed it was attractive. Immediately noticeable is the large, glossy center console painted in a striking red hue. Matching door inserts and fabric round out the colorful interior palette. I’m not a big guy, but the front leather seats felt somewhat smallish to me. The rear seats have ample room. The rear cargo area is quite tiny, partially due to the angles of the rear seats and rear windshield. The rear seats do fold down if you need to haul something larger. There’s a distinct techy feel to the interior, from the dashboard details, to the two LCD monitors. Speaking of, the Juke had one of the most remarkable dashboard center stacks we’ve recently seen. Up top is a monitor that displays the navigation, reverse camera, and entertainment system by Rockford Fosgate. Speaking of, this car has a phenomenal stereo system; probably one of the best we’ve ever heard. No matter the kind of music or how loud we wanted it, the stereo was up to the task. Fantastic. The only downside? No streaming Bluetooth Audio. I’m not sure why they skimped on this feature given the car’s techy nature. The lower LCD unit is responsible for displaying the easy-to-use climate control and the D-mode system, which allows drivers to change between normal, sport, and eco driving modes. One of the coolest things was that the climate control and D-mode controls share the exact same buttons. When you switch between the climate and D-modes, the illuminated buttons actually change their verbiage: From amber climate controls symbols to white D-mode option text. It has to be seen to appreciate, but trust me, it’s pretty cool. The Juke offers plenty of power in both city and highway driving. The power comes at the expense of mileage. I spent most of my driving time in the “sport” mode. Even in the normal driving mode the Juke has an abundance of power. 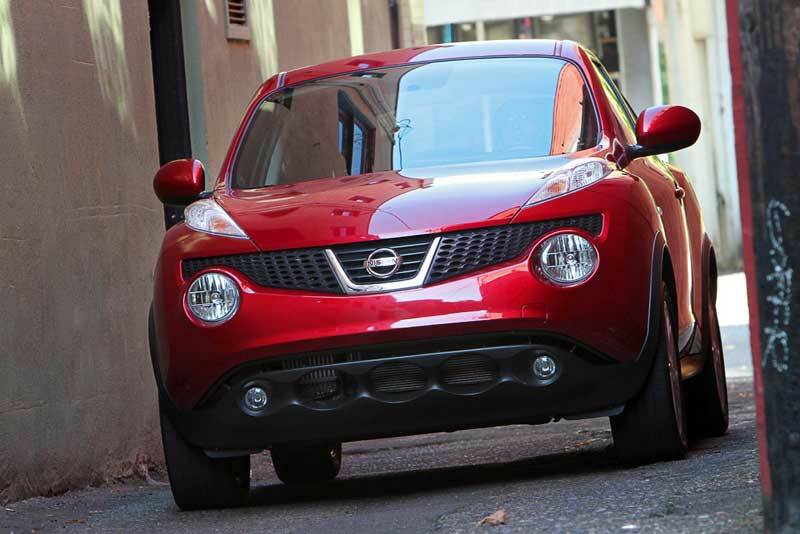 Powered by a 1.6-liter turbocharged, intercooled four cylinder, the Juke makes 188 horsepower and 177 ft./lbs. of torque. 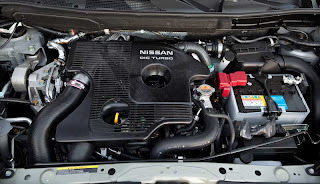 That power is run through Nissan’s Xtronic CVT, and put down to all four wheels via the car’s torque-vectoring all-wheel drive system. This system has three modes: front-wheel, all-wheel V, and all-wheel drive. The “V” mode has more torque vectoring than the standard AWD mode, for what it’s worth. Direct-injection engine make 188 hp. and 177 ft./lbs. of torque. As someone not so fond of CVTs, I expected power delivery to be awkward and the driving experience to be somewhat hampered. And although I almost always prefer a manual transmission, the Xtronic CVT pairs well with the 1.6-liter engine. 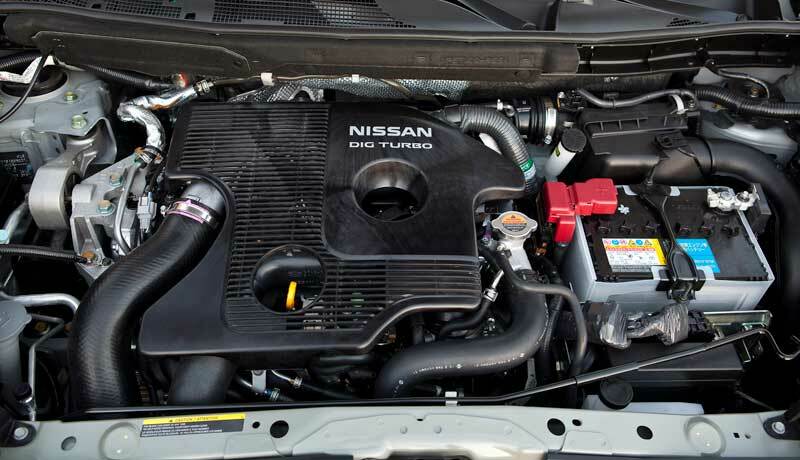 There’s plenty of power on tap at all times, and the Juke was very fun to drive. Handling was sporty with plenty of grip. This thing really scoots. With all that “scooting” comes fuel consumption. The AWD Juke SL is EPA rated at 25 city, 30 highway on premium fuel. I calculated my fuel economy at a terrible 17 MPG. Now, perhaps the trip odometer wasn’t zeroed out when it was filled up; maybe it was running on 87 octane (which it will do, but won’t deliver as high of performance); maybe I was just turbo-happy. Regardless, even if I had gotten 20 MPG, it would’ve been poor. 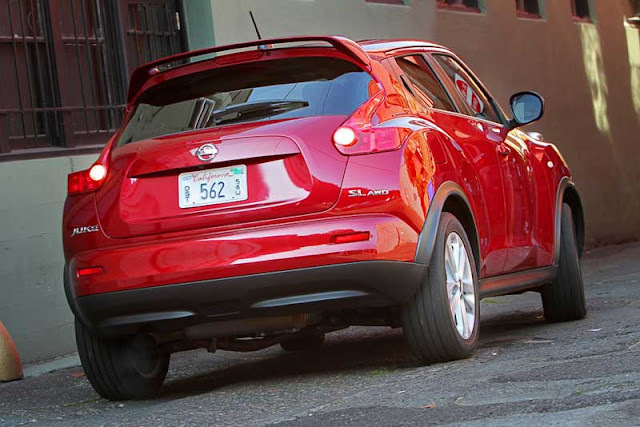 The Juke is a interesting mix of utility, performance, and practicality. Our 2011 Juke SL AWD stickered at just under $25,000. That seemed a bit steep to us. Then again, its closest competitor—the MINI Countryman SALL4—starts at $26,950, so perhaps it’s not all that costly for its segment. It would be more than we’d pay. However, if you’re looking for a turbocharged, AWD hatchback that stands apart (way apart) from the crowd, check out the Juke. I think its' stiffest competition might come from the new Impreza.